Crafting Confessions: Happy Birthday, TCM! "Happy First Birthday to The Craft's Meow!" Yup, today is the official first birthday of The Craft's Meow; and after a fabulous party these past few days, we're ending it off with a blog hop. I really wanted that red heart to 'pop' from the design and be the focal point so kept the rest of the card white. The tiny heart was punched from a heart-lace border punch - never throw away those li'l shapes that you punch out y'know...! 1. Join in this hop and comment on everyone's post to be in with the chance of winning the entrire release! (That's a total of 6 sets!) The winner will be one random commenter from one of our blogs. You've got until Friday March 23rd 9pm PST to make the rounds! 3. Today is release day! Spend $50 or more at the TCM Store up to March 31st to receive the fabulous set, Thanks Bee to Thee absolutely FREE! A $100 gift certificate for the TCM Store if the page hits 2,000 likes by March 31st! OK so back to the hop! It's been lovely to have you hop here today - time to hop along to Ivana! Sooo fabulously CAS and perfect! LOVE it Aimes! I love that it's so simple but very elegant. Love the white on white layering! I never think to do this!!! What an amazing CAS card, and like you mentioned... PERFECT for a guy too!! Another clean and simple classic! Love it! love the white on white panel...makes the image stand out.Thanks for sharing. Clean and simple to the max! Stunning design with simple elements, just gorgeous !! such a cute little card, great idea for my man too! Brilliant post dear girl! And I love your wee card with the pop of read... CAS at its best!!! I've loved everything you've done for the previews and blog hop. I'm only sorry I couldn't get around sooner to leave comments... this has been a crazy week for me, but it's all good! Thank you so much!!! I am thrilled to have you on our team! This is a great CAS card! Very cute! super CAS and perfect for a guy or a girl. Such a sweet, CAS card! Love it! Wonderful mini card--the heart really pops! Who says simple isn't wonderful, WOW! This is adorable, Aimes! Shows the wonderful versatility of that set! Fabby work this week!! Fabulous CAS card. Great idea for a hubby's lunch box! I love that it's so simple! I'm saving this one for next Valentine's day....perfect! A sweet little CAS card!! How nice. The heart really stands out. PERFECTION! Very sweet lil' card. Love this sweet and simple card! Lovely CAS card! That envie is so cute it can stand out alone. What a lovely CAS card. I am only learning the joy of creating a card with little, but the effect is amazing! Wow, I like the white space on this card. It makes the focal image really pop. wow truly amazing the heart really punches out. I love the crisp and clean look! I love the clean and simple look of your card. I can always count on you for a great CAS card. I'm sure the guy loves getting little notes in his lunch. I would! The heart is so striking against the white. Great card! This is so sweet Amy and the stamp really pops against the white! 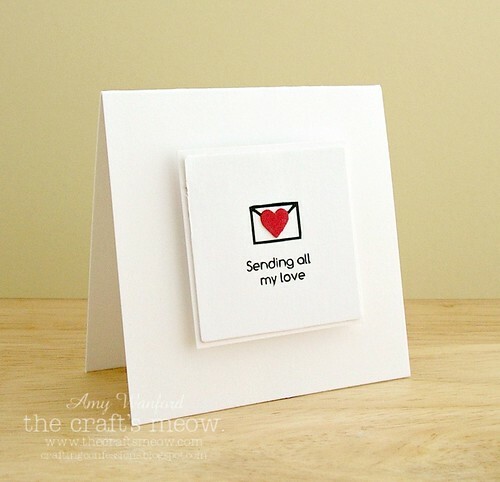 Gorgeous and cleverly simple card! Less IS more! Love the white space on your card creation. Just so very lovely, Aimes! Beautiful card. I like the layers of white and the way it pops up. Great job. 3x3! I love mini cards! 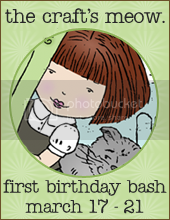 Thanks for all the blog support during TCM birthday celebration when I was guest designer!